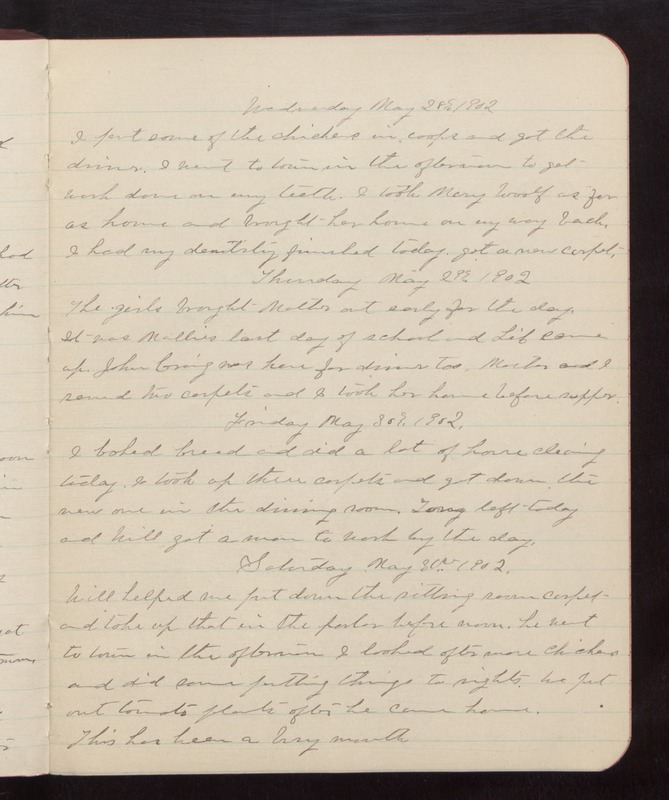 Wednesday May 28th 1902 I put some of the chickens in coops and got the dinner. I went to town in the afternoon to get work done on my teeth. I took Mary Woolf as far as home and brought her home on my way back. I had my dentistry finished today. got a new carpet. Thursday May 29th 1902 The girls brought Mother out early for the day. It was Mollies last day of school and Lib came up. John Craig was here for dinner too. Mother and I sewed two carpets and I took her home before supper. Friday May 30th 1902 I baked bread and did a lot of house cleaning today. I took up three carpets and got down the new one in the dining room. Terry left today and Will got a man to work by the day. Saturday May 30th 1902 Will helped me put down the sitting room carpet and take up that in the parlor before noon. he went to town in the afternoon. I looked after more chickens and did some putting things to rights. We put out tomato plants after he came home. This has been a busy month.